Strak LED All Glass Filament Clear Candlabra Bulb E12 Base - Flame Tip 4W 400lm Dimmable CUL/UL listed ,High CRI (90). Warm White , Instant On, Mercury and Rohs complaint Construction. Similar sizing as regular Incandescent Candle Bulbs. Exactly 1 to 1 ratio for replacement. 80-90% Consumption savings. 50,000 Hours and 5 years Warranty. LED 25W A15 Vintage filament bulb. Clear colour (2200K). Non-dimmable. Classic style and shape with LED advantages. Energy saving LED bulb mimics nostalgic incandescent filament design. Timeless, decorative appeal - bulbs look great switched on or off. Vintage glow without high energy bills. UL- Wet rated for indoor and outdoor use. Instant-on delivering beautiful, consistent light. 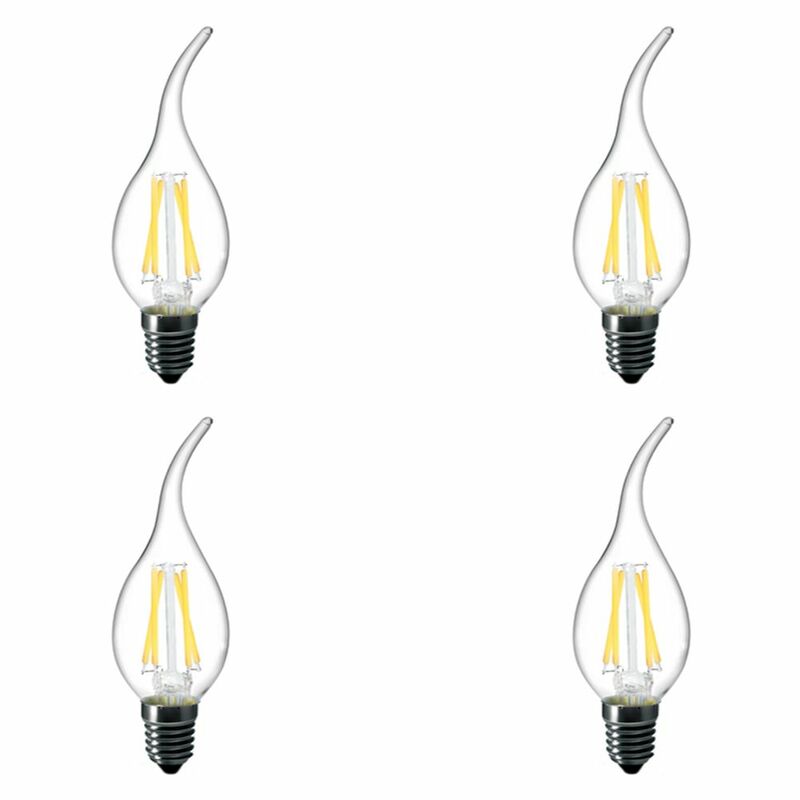 A15 shape similar size and shape as traditional filament 25W bulb. Medium base (E26). Philips LED 40W equivalent Decorative A15 Fan bulb with dimmable warm glow light (2700K- 2200K). As light is dimmed, the colour temperature transitions from 2700K to 2200K creating a warm glow replicating incandescent lighting. Energy savings and long life. Soft, sparkling white light. Dimmable. Instant-on light. Mercury and RoHS compliant construction. Similar size and shape as regular 40W incandescent bulb. Ideal for chandeliers, wall sconces decorative fixtures. Medium base (E26). LED 40W BA11 Chandelier Vintage filament bulb. Clear colour (2200K). Dimmable. Classic style and shape with LED advantages. Energy saving LED bulb mimics nostalgic incandescent filament design. Timeless, decorative appeal - bulbs look great switched on or off. Vintage glow without high energy bills. Indoor use. Instant-on delivering beautiful, consistent light. BA11 shape similar size and shape as traditional filament 25W bulb. Candelabra base (E12). LED Filament Clear Candlelabra Flame Tip 2700K 40W E12 CRI90 ES Dimmable- Pack of 4 - ENERGY STAR® Strak LED All Glass Filament Clear Candlabra Bulb E12 Base - Flame Tip 4W 400lm Dimmable CUL/UL listed ,High CRI (90). Warm White , Instant On, Mercury and Rohs complaint Construction. Similar sizing as regular Incandescent Candle Bulbs. Exactly 1 to 1 ratio for replacement. 80-90% Consumption savings. 50,000 Hours and 5 years Warranty.